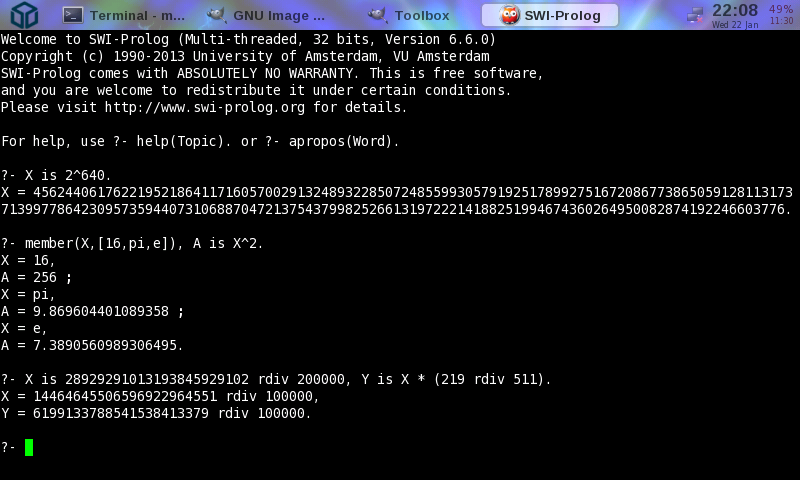 SWI-Prolog is a comprehensive and portable implementation of the Prolog programming language. SWI-Prolog aims to be a robust and scalable implementation supporting a wide range of applications. due to robust support for multithreading and HTTP server libraries. framework developed in cooperation with YAP and instantiated for YAP, SICStus and IF/Prolog. Is anyone able to get a factorial example running without crashing? Also, X is 2^7777. is impressive. Works fine. The integrated help browser window splitter is slightly too far right by default. I've been waitung for this! Messing around with Prolog on the go - cool. Thanks for making the PND!